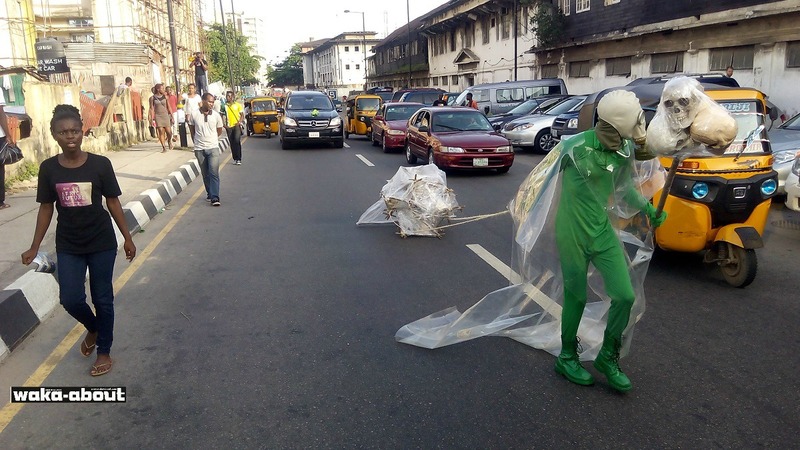 Jelili Atiku’s public performance at the Goethe-Institut ‘African Futures’ Festival in Lagos lasted roughly 30 minutes but it caused a stir in the neighbourhood. 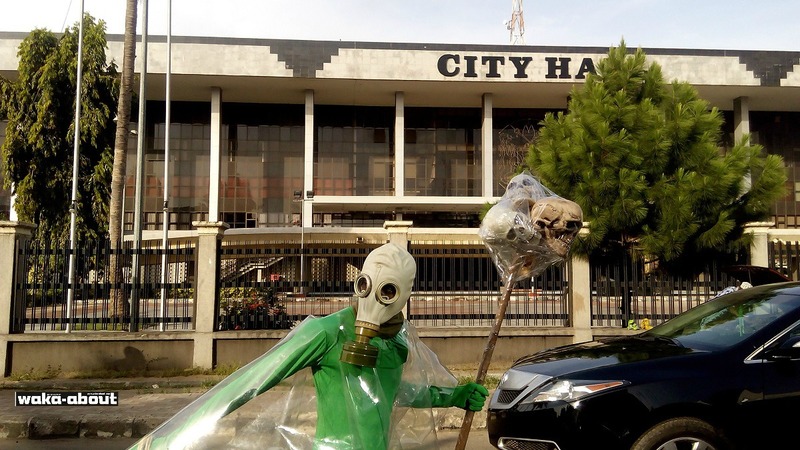 Traffic halted as he marched through the streets and crossed intersections, pulling a bizarre lightweight object behind him; residents stared at him curiously, passersby pulled out their phones and snapped away, while kids cried or dashed indoors when Atiku walked into view. If you were in the vicinity, you probably would have reacted similarly. 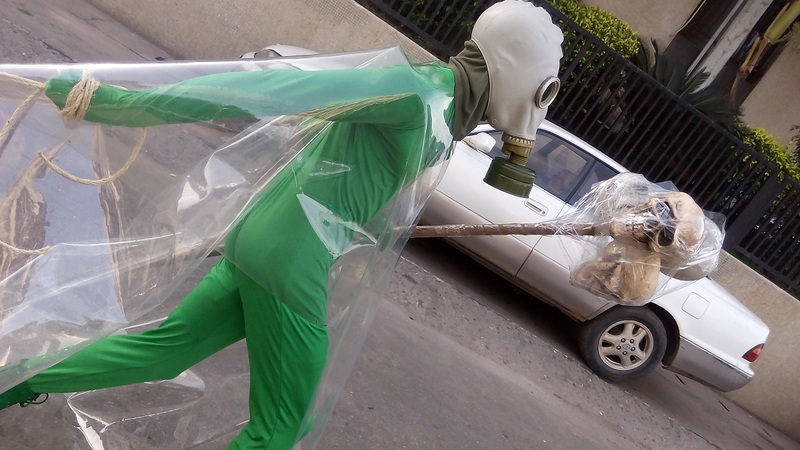 That’s because the artist stood out in his costume–green overalls, green gloves, green boots and a green gas-mask, all complemented by transparent polythene which drapes over his shoulders, falling to the ground both in front and behind him. To complete the otherworldly appearance, he held a staff supporting four skulls in his left hand. As more than a dozen of us walked with him—from a point on Broad Street through Catholic Mission Street and back to Broad Street—the one word that kept flashing to my mind was Ebola (the disease that resurged and ravaged parts of West Africa in 2014 and killed several thousands). The mask on his head, eerily similar to what health professionals and volunteer caregivers had to wear in Liberia and Sierra Leone, the two countries that were most affected by the virus. Atiku has been hailed as a people’s artist (as opposed to the elitist types) who targets the grassroots with his work, and by so doing creating enlightenment among the multitude. For more than a decade, he has created very outspoken art, art that speak to various societal issues. 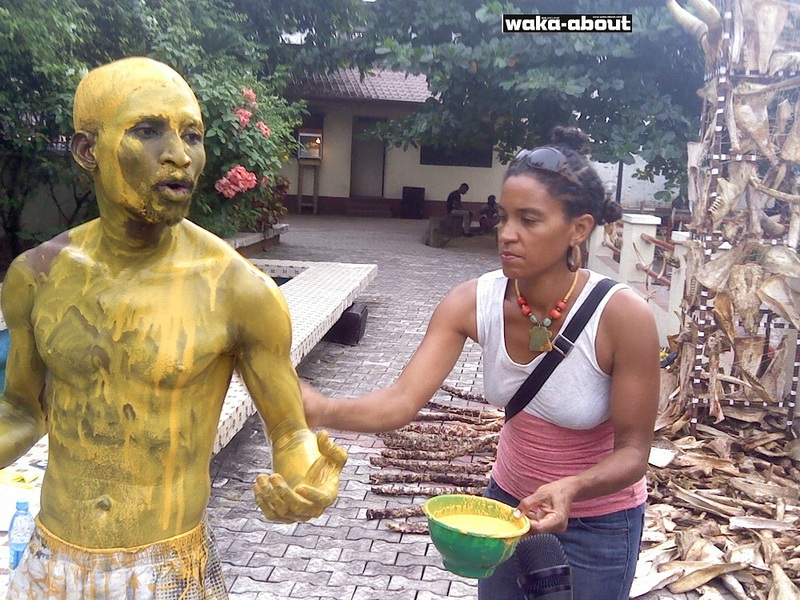 In July 2012, I watched him stage a performance at the Freedom Park in Lagos—part of activities to mark the 50th anniversary of Goethe Institut in Nigeria—that questions the “cannibalistic tendency of humans, which has permeated all human endeavours, especially religion”; wearing only briefs, Atiku bathed himself in yellow paint from head to toe and stood inches from a pile of cattle bones. Already used to the attention his performances and costumes generate among the public, Atiku was not bothered that his performance that Saturday afternoon disrupted the normal flow of activity on his chosen path.